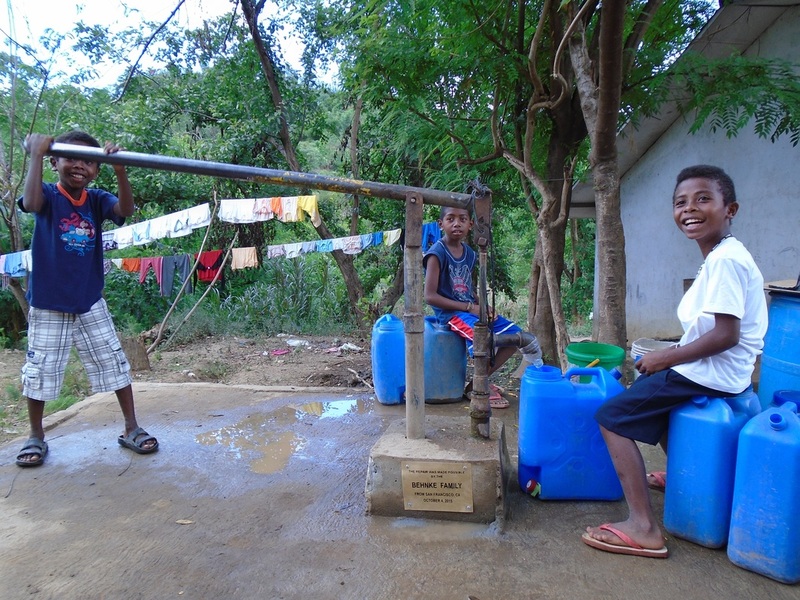 Our First ever well as it brings water to the surface in Nabuclod, Philippines. "Do You have any questions?" I asked, having just finished telling them the nights dinner specials. There was hardly space for what you might call a pause, when he responded, "I do" . I thought he would ask me about gluten, dairy, or well, anything except what came next. As it turned out he had followed my artwork for years and instead of asking about food it turned beautifully personal as he asked me about my newest process. I was smiling with a touch of disbelief as I had no idea that someone eating at the restaurant where I waited tables knew that I was an artist. He asked me, "what exactly is the artwork that you're creating?". The honest answer, was nothing, and for that, his timing couldn't have been better. I was at a beautiful crossroads readying to host live talks by philanthropists, entrepreneurs, and artists. As I told him this he barely could contain himself for the serendipity of the moment. As it turned out he had just filed the paperwork and officially had become a registered 501 (c) 3 non profit and was there to celebrate. He was dying to tell anyone who would listen his amazing story. We had one spot left for one last speaker. One month later he would tell us about growing up in poverty, felling coconut trees to float his family to safety during floods in his native Philippines, and then his remarkable change of fate in moving to America, putting himself through school, creating his own company, and retiring early, only to return to his beloved Philippines to find the indigenous tribe he'd grown up along dying in poverty without sufficient access to clean water. I was moved, after the talks, and inspired by the serendipity of it all. We stayed in touch and eventually over lunch he would ask me to join his board of directors at his newly formed foundation. After doing so we had a great run together as I pitched his project to friends of mine. They were phenomenally generous in funding 100% of the phase one seed capital for our project in the Philippines. They asked that I go in person as well as invest myself into the project. I was there in November and December of 2015 while we were a part of installing clean water wells for the indigenous Aeta Tribes of the Philippines. We gave away hundreds of 5 gallon carrying containers for collecting the water, newly brought to the surface, as well as hundreds of backpacks, school supplies, and two water buffalo. It was a phenomenal trip but also one that was profoundly intense, where any success felt magnified and life changing for the Aeta but so too did the failures, all of this being further magnified by the idea of taking both of these personally, both motivating and crushing. The trip was both intense in outline, but so too personally. 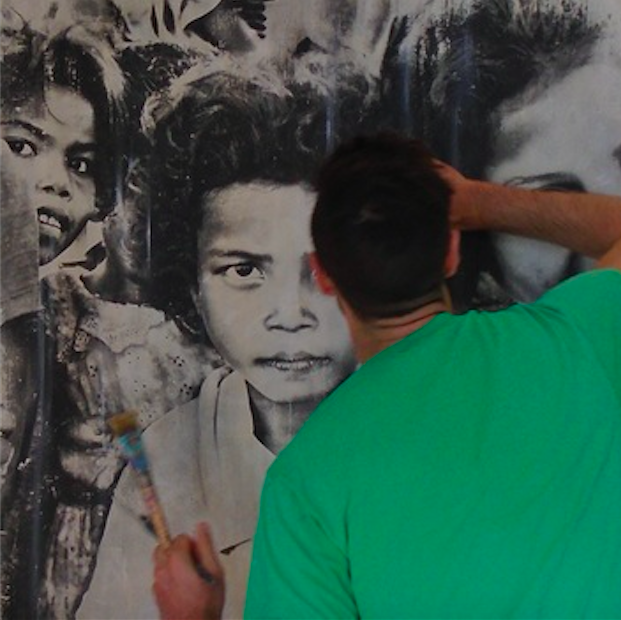 The trip, its potential, and my feelings formed the body of artwork that I created on the Indigenous Aeta Tribes. In fact the beauty of the two antipodal feelings were no more clearly illustrated in words than on the morning that I walked into the village where we had installed our first ever water well. I had inflamed a previously crushed disc in my back during our journey through the rural Philippines where the Indigenous Aeta Tribe lives, but that was not going to stop me from seeing The Aeta Tribe Foundation’s first ever clean water well. I stood there smiling at the young boy pumping the first clean water in his thus far, brief lifetime from that well. As he smiled back at me so too did his friends as they sat on the dozens of buckets, containers, reused water bottles, and really anything that could be found while they waited their turn to collect water for each of their families from the newly repaired water well in the heart of their village. We smiled at each other, me not knowing who they were, they not knowing who I was, but together, collectively knowing in our smiles that lives had just changed, and profoundly so, for the better because of the well we all stood around listening to. As its newly repaired parts squeaked than squished water to the surface from hundreds of feet below, filling the containers that they would bring to the village school and the rest of their families. As I stood there feeling the intense pain in my spine so too I felt the idea behind both meaning and purpose in life and knowing that those words are continually connected to giving and the beauty one finds in being connected to something greater than any individual. A dream and its potential to change lives. This however is not the end of the story, in fact this story is one that likely doesn't have a happy ending as wells continually go dry, breakdown, and in some cases are sabotaged by others. As water scarcity continues to grow around the world this problem will become more of a norm for a majority of those living in the developing world. The color picture, at right, is our first ever well as it brings water to the surface, adding life to this village in the rural Mountains of the Philippines. You see before this well was pumping water it sat there, with dusty burlap wrapped around it, a constant reminder to villagers that it hadn’t worked in nearly two decades and that they would need to walk miles down the mountainside to the next closest water source for that days water. Now they no longer walk miles to get what was questionably clean water at the bottom of the mountain, for the day. A process which will begin anew tomorrow and the next all the while NGO's and governmental agencies alike attempt to maintain wells and bring clean water to a world who is finding this most precious resource become scarcer by the day. 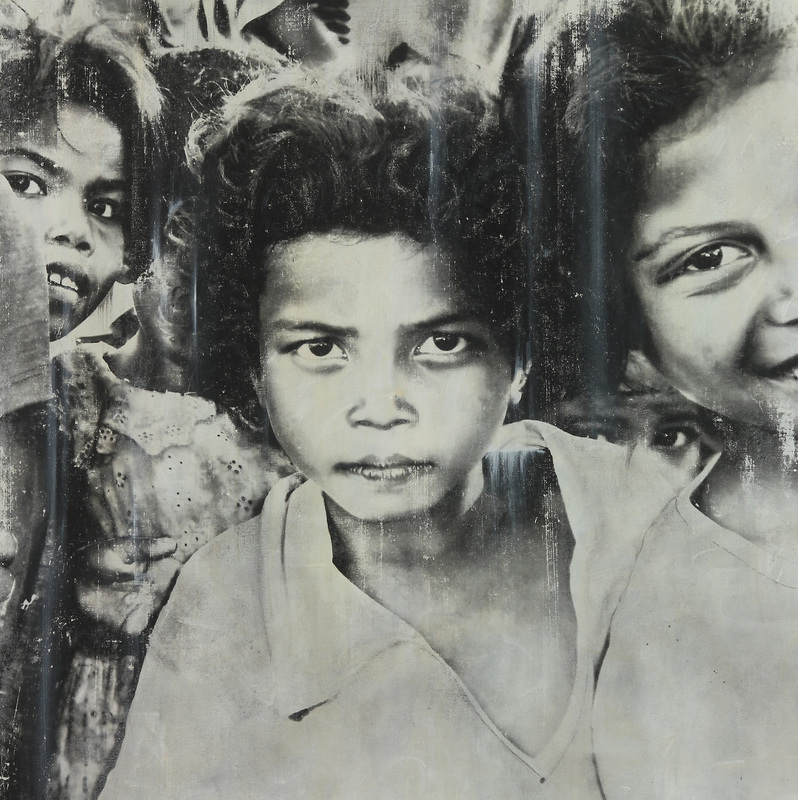 The black and white artworks of the indigenous Aeta Tribes were made of the children who carry the water to and from their villages. Those whose lives would be affected by the process of installing new water wells. These artworks put to story the beauty of this tribe and its disappearing people. 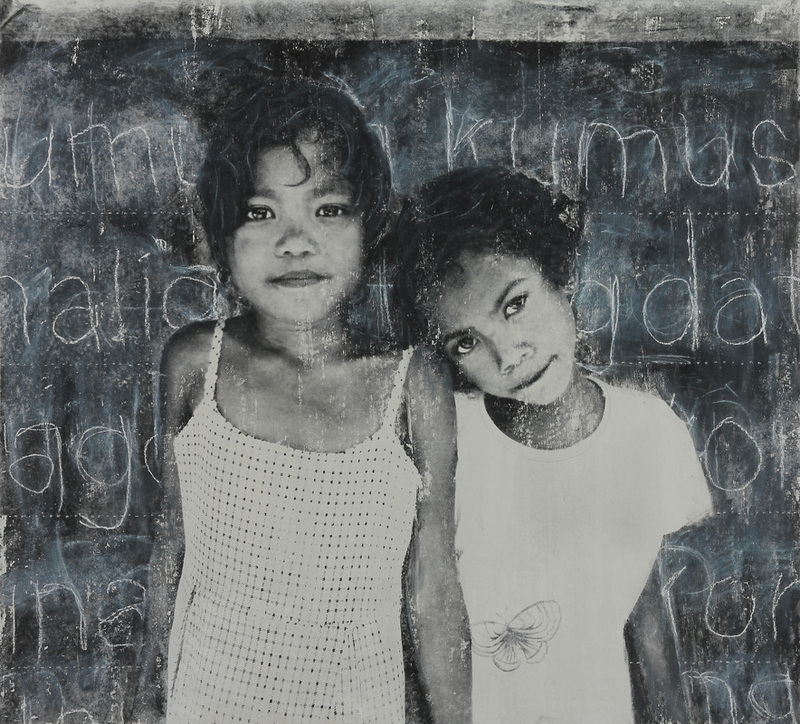 The first in the series of artworks depicting the children of The Aeta Tribes. Our first well brings water to the surface.